Put all your work into the backlog column. Limit the number of tasks in the "work in progress" column. This is the WIP limit. That's all. If you like to dig deeper, read Jim Benson's book and blog (/1, 2/). There are a lot of Kanban tools out there. I really like trello. 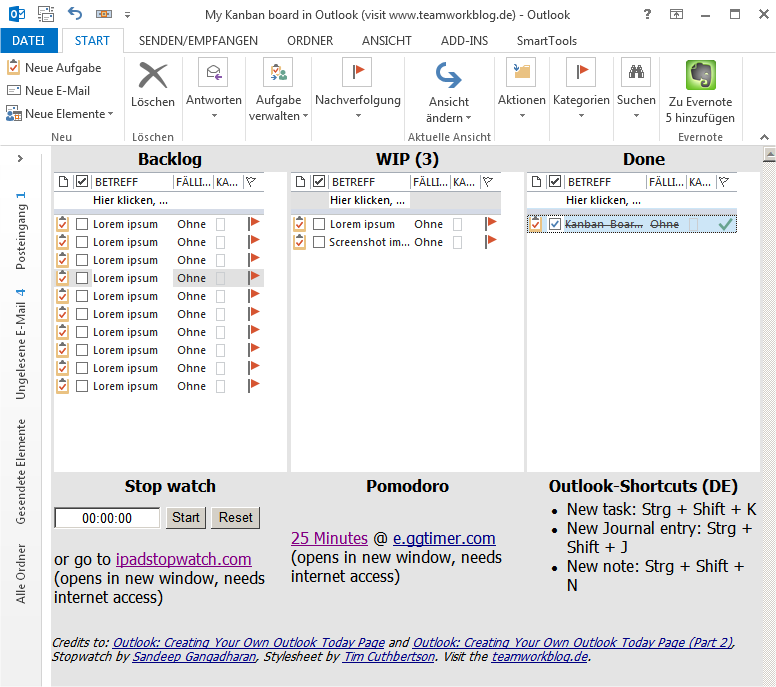 But some users asked, if there is a Kanban version for Microsoft Outlook. I have a least 2 work places. My Kanban board has to travel with me. I manage my tasks with Microsoft Outlook®. What I really like is Outlook's function to drag an e-mail into the task folder for making a task of it. I'm having about 50 - 100 tasks in my task list. I don't like to transfer tasks from one list to another. Switching of tools interrupts my flow of work. I don't want to have so many tools. I've figured out how to build a Kanban board with Outlook today" and three task folders. Inspiring was a blog article by ShamansTears. Unfortunately the post has been deleted. This is how my "Outlook Today" looks like (Fig. 1). It is very easy to drag one task with the mouse from one column to another. Instead of "WIP" use the names of your folders. The HTML table is stored somewhere on your computer. Use that file as home page for a special folder in Outlook. Jim Boyce offers a short description how to add a custom Outlook Today view. This is my point: A good idea like Kanban needs a technical solution (e. g. w/ Outlook) in order to use it effectively and very quickly in your daily business. Next time, when you wonder why a good idea is stuck, ask yourself if you have the right tools. Teams who work with Kanban report real improvements (/2, 4/). Every team has to visualize its work; at best with a real board in your office. That motivates the team. If your team is scattered over different places, start with a simple solution based on public folders in Outlook. /4/ Anderson, David J. ; Reinertsen, Donald G: Kanban : Successful Evolutionary Change for Your Technology Business. : Blue Hole, 2010.
ich habe es mit verschiedenen Aufgabenordner probiert (Aufgabenordner1, Aufgabenordner2, Aufgabenordner2), allerdings wird dann nichts angezeigt. Wenn ich auf den Default-Ordner (... value="Aufgaben">) zugreife, dann funktioniert alles. Wie greift Ihr auf die einzelnen Aufgabenordner zu? The Jim Boyce site is down and I can't quite figure this out. We have an html table stored as the home page for a special folder but I'm not sure how to add the custom outlook today view without the Jim Boyce link. Please help and thanks! Another great Kanban knowledge source is Kanban Library - http://kanbantool.com/kanban-library/introduction. It is an online collection of blog post, articles and presentation, organized by topics. Except Personal Kanban related materials, you will find here information on how to start with Kanban method, how to design Kanban board, how to read Kanban analytics and metrics, what is the difference between scrum and kanban, what is scrumban. Moreover, case studies and book reviews. Good Morning Jan, I notice that you have a pomodoro timer in your kanban view, I think that is very helpfull for the process, and I would like to use in my Outlook. Could you please bring me some steps to implement this in my kanban view? thanks in advance for your help.